Jane’s verses do tend to jump out of our mouths fully clothed in melody! In 2016, our collected work coalesced into an interstitial arts performance of poetry and music, The Infinite Dark. Our first concert in October 2016 was a rousing success. Since then, Max has been recording and editing tracks for a followup CD of the show. 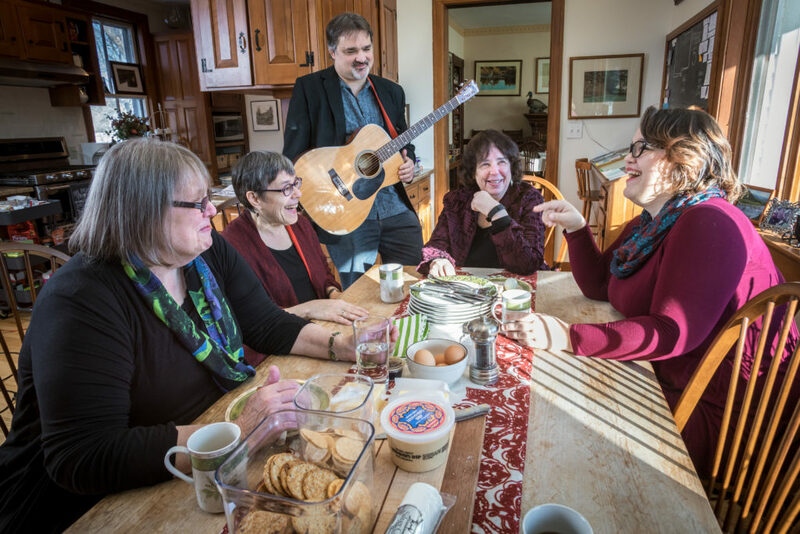 The CD includes six tracks of Jane reading her poetry and eight songs from Max, Lui and I. Molly and I each read one of Jane’s poems and Max stitches it all together – poetry and song – with his unique guitar wizardry. The connections in this group go deep. I worked with Lui in the ’90s on her Stone by Stone CD, where she recorded my original, Blessing (links to my recording). Our voices blend so sweetly and it’s a joy to work with someone who loves to dig into an arrangement. We have so many options for sound since she plays the tenor ukulele, the piano, the banjo, and even (though we don’t use it in the show yet), the clarinet! Max Cohen’s guitar, composition and arranging chops are prodigious and equal to his skills at digital engineering. He’s gotten terrific results already on this CD. I am a lucky fiddler indeed – Max and I have worked together for twelve years. I love our conversations without words! We’ve released two CDs (both engineered by him): Orange on Blue – instrumental duets, and This Distant Shore from Celtic band Mist Covered Mountains with Max, Molly and me. Molly Hebert-Wilson is my daughter, so of course I think she’s a great singer, but then, she really IS a great singer! You’ll hear her high harmonies on several of the songs and her solo setting of an Irish invocation to the Goddess Brigid gives me chills. Hair-raising! Our photo shoot with Northampton photographer Paul Shoul just before Christmas yielded a slew of great pics that we’ll share soon. Paul took the cover photos for my Rude Girls Flying Fish LP in 1987, gawd, a whole lifetime ago. What a kick to work with him again! I’m not sure if we’ll end up using the glam shot with Jane in full Jessica Rabbit sprawl across the top of the grand piano (Rude Girls would have been proud! ), but you should definitely check future blog posts to find out! We’ll write soon with more news and samples from the new CD, featuring instrumentals later. Look for Jane Yolen reciting one of her poems! Join our newsletter list in the right sidebar. We don’t spam you and you will only receive occasional news about the show with Jane and/or the 3 ravens band – Max, Lui & Donna. Be sure to add us – donna (at) the3ravens (dot) com – to your email inbox list. We’ve also opened a Facebook band page – please drop by and ‘like’ the page. Thanks again for your support. What’s on the new CD?